A commercial truck driver died in a single-vehicle accident on Interstate 84 near milepost 10. Oregon State Police troopers were called to the scene around 9:40 p.m. on Friday, April 12. 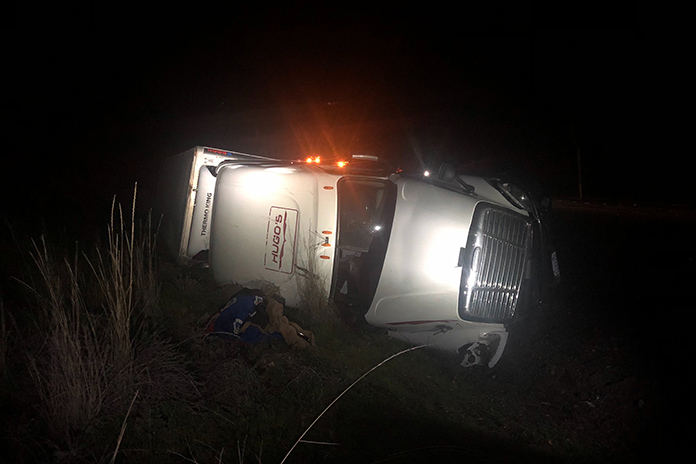 According to the OSP, the commercial motor vehicle was eastbound on Interstate 82 when it left the roadway and overturned. The driver sustained fatal injuries and was pronounced deceased at the scene. The driver’s name has not been released. The passenger was transported by Life Flight to Kadlec Regional Medical Center in Richland, Wash. The OSP was assisted by the Umatilla County Fire Department, Life Flight, Umatilla County Sheriff’s Office, Morrow County Sheriff’s Office, Stanfield Police Department, and the Oregon Department of Transportation.